Cacao trees are native to and thrive mainly in the tropical rainforests of South and Central America, Mexico and Africa, but are also grown on farms known as sun plantations. They are usually grown as a single crop, a practice known as monocropping. 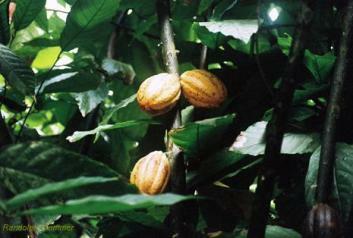 However, Theobroma Cacao needs very specific conditions in order to bear fruit and can be damaged when out of its natural habitat. Growing Theobroma on sun plantations often has negative ecological and financial consequences for the crops and the farmers who grow them. On these farms, rather than being sheltered by canopy trees and allowed to grow naturally, the cacao trees are only shaded until maturity and are then fully exposed to the sun. Cacao grown in this manner will generally produce larger yields, but will only produce pods for 10 years. In the rainforest, the trees can produce pods for up to 25 years, flowering continuously when mature. One issue is the fact that natural pollinators are not as prevalent on sun plantation crops, and the trees are often susceptible to pests and diseases which are kept in balance in the natural habitat of the rainforest. Another problem is the use of chemical fertilizers and pesticides to protect the crops, as the loss of crops and falling prices of chocolate can result in financial devastation for many cacao farmers. Sustainable cacao farms offer an alternative and ensure that rainforest areas remain undamaged, while taking advantage of natural conditions that are more beneficial for the crops. Small scale farms that border threatened rainforest areas create protected “buffer zones” that guard against human encroachment. Organic border farms like these can make use of natural pollinators and pest control native to the rainforest habitat rather than using destructive and toxic pesticides, fungicides, and fertilizers. They also enhance the continued natural growth and production of the cacao trees over a longer period of time. Organic farms are also beneficial to the livelihoods of the farmers through the practice of “intercropping”. This allows the farmers to cultivate other cash crops including chili peppers, cashews, rubber, mangos, lemons, limes, and avocados alongside the cacao trees. It is a perfect example of humans working in harmony with nature to get the best possible results while maintaining environmental equilibrium. Click here to return from Cacao Trees to Natural and Organic Food.